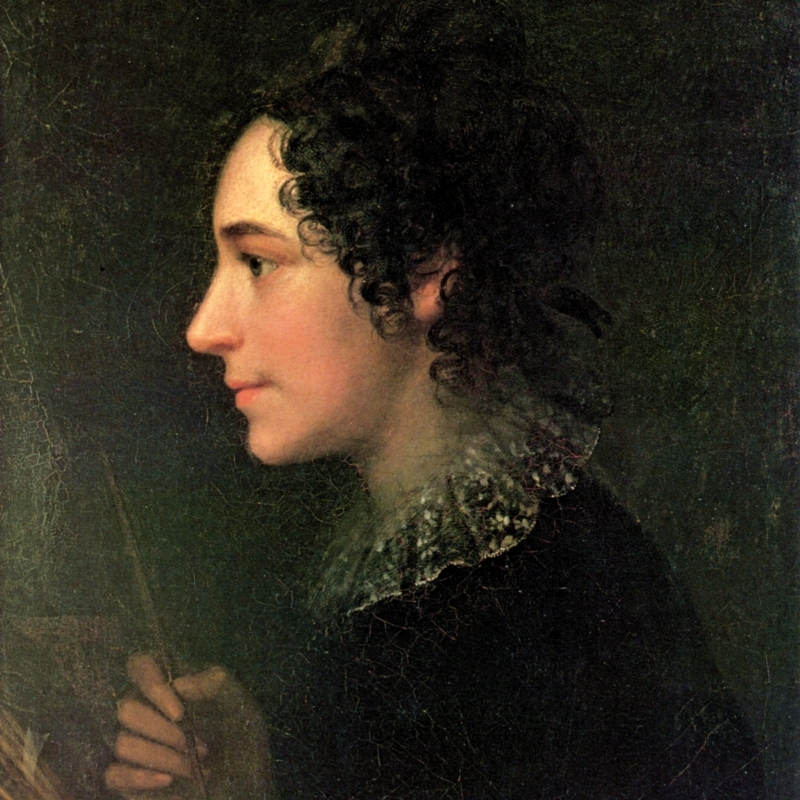 “Self Portrait as a Painter [detail],” oil on canvas, by Marie Ellenrieder, 1819. “I don’t expect you to remember me,” she says. The Atlanta bar is loud around us. She’s maybe late 30s, with dark hair and eyes, apple cheeks, a certain kind of defiance about the lips. She tells me her name, Jessica. “We were pen pals almost 20 years ago,” she says. I stare hard at her and ransack the mental files. Nothing. Later I will learn that Jessica heard my name from what turned out to be a mutual friend, who knew I’d be in the bar on this night for a special event. It’s over and the crowd is shuffling out. She lowers her eyes. “I still have those letters. I just wanted you to know how much they meant to me.” She was ready to quit writing in those days and I encouraged her, she says. In the past couple of years, I’ve started collecting old handwritten diaries and letters. The hobby arose as if out of nowhere, intense and mysterious. When asked to explain it, I tell people about my father. Tom prowled yard sales for antiques he could mark up and resell. At his bank-teller job, he sorted bags of coins, plucking the rare finds and replacing them with his own pocket change, worth only face value. One of the first to own a metal detector, he haunted public parks on weekends, waving his wand like a dowsing rod. He unearthed tiny balls of tinfoil and flip-tops from soda cans, an occasional brooch pin or bauble. One day as a toddler I stood at his side when he dumped onto the table his latest pile of flea-market junk. A hardcover book fell to the floor. When I opened it, the spine crackled. Spidery script in ancient ink lined the crumbly yellow pages. Wedged between them was a lock of hair, snipped and preserved more than a century before. I exhaled and the filaments trembled as if alive. My spare bedroom is piled with crates full of folders and padded envelopes, the scribbled records of the pasts of strangers. Not that I plan to profit by passing them on. These I am keeping. The scans arrive by email from Jessica. My letters, dated between June and November 1996, are not handwritten as I hoped but generated by an old-style dot-matrix printer, probably in Creative Loafing’s office. Most striking about them is how little my “correspondent” voice has changed, given all that history. Brisk, jaunty, self-deprecating. Is there an essential me? An immutable set of qualities that add up to an entity, myself, never to be mistaken for another? As part of my day job—I’m a biotechnology journalist, handling the daily news of DNA and disease—I was assigned a few months ago to write about a saliva-based genetic test that purports to find predisposition to disease. I spat in the test tube. “You have really good genes,” the consultant told me after checking the results. Except for one hitch: one copy of the APOE3 gene, which confers an average risk for Alzheimer’s disease, and one copy of the APOE4 gene, which means high risk. About 22 percent of the population bears this genotype, and it doubles my odds of Alzheimer’s. When I am held down screaming in some filthy public hospital (so I envision it) as the nurse finds a vein, what of that essential me will exist? In one of the letters to Jessica, I mentioned that although she has referred to prose as a blind corridor, she did not go so far as to call it a brick wall. “Even those who pretend we know what we’re doing are really groping along.” I described my father’s recent accident, which rendered him a paraplegic, and my fumbling attempts to handle his affairs. Maybe this is what prompted Jessica to send me an essay next, about her own father. “I like the way you folded into the second version of the truck-stop story how he is aging,” went my reply. At the end, “Maybe I will get to meet you someday! That would be good. I have things to ask you about fiction vs. non-fiction, and the difficulties of each.” How non-fiction can become fiction so easily, as recollections fail. November 1996. In another year, the newspaper job would end. In two years, my wife would leave me a letter—also dot-matrix, in a business-sized envelope—on the pillow of the guest room where I had been sleeping. And then I was divorced. They tow my decrepit Subaru from the parking deck of our apartment complex. Having misplaced the title, I avoided the hassle of getting new tags after I moved here from California. The truth is, I pretty much neglected the car altogether. Probably because of the flat tire, someone reported it as abandoned. I don’t bother visiting the impound garage to harangue some bored clerk in his cage. What’s a car anyway but the means of transport? Like the body hauls the soul around, until the soul alone is transported … somewhere. No doubt the Subaru will be auctioned or flattened for scrap, so I let my driver’s license expire, too. My watch quits working and I throw it away. All of this I recognize as the wordless language of relinquishment. I’ve waited a long time to get old. After high school, I knew that I needed more life in order to have anything worth saying to a blank page. I wanted to claw the calendar pages off in bunches and accumulate a past. I wanted to let time etch lines in my face and scorch my soul. It happened, but I don’t know much more today than before, though I feel friendlier with the questions, more patient. Less patient, too, almost violently so, as the death clock ticks on. I’m pushing 60. It’s not pushing back. Still left to quit is my job. I phone a financial advisor to ask about retirement prospects. He wants a list of assets and I almost laugh. As he will, when he gets the “list.” It’s on the night after this conversation when shy Jessica sidles up to remind me about the letters. “You did a good thing,” she says. I guess Jessica’s age is about the same as mine when our letter exchange began. Such women look away from me in the street. Everyone understands this is instinct, simple biology, and nothing personal. Their DNA makes them not return my gaze for the same reason my DNA makes me hope (absurdly, because then what?) they will. Our respective strands of chromosomes, our stranded chromosomes, want only to replicate with the optimal candidate. For mine, they are it. For theirs, I am not. Yet another, larger part of me feels a wash of relief at not much caring. The soul separates from the body, which is not much of a big deal. Can it be starting already? What’s astounding, so lucky, is that they came together in the first place. One of my early letters to Jessica closed with, “I want to help and am running out of time.” Another scrap of unintended melodrama, true in one way during the moment of composition—I was headed out the door, late for a flight—and more broadly true in another way now. If I see her again, I’ll tell her, since it’s possible she will understand, about my stockpile of handwritten letters and diaries. About the form of treasure they make up for me in the language of those who’ve relinquished everything, happily or not. About how the once-blank pages are filled with insistent claims, clamoring to be heard, silently bursting with what we’re expected to remember. “Face Value” originally appeared in Full Grown People. Randy Osborne writes in Atlanta, where he teaches creative nonfiction at Emory University. He is finishing a book of personal essays, and is represented by Brandt & Hochman in New York. I really enjoyed the flashback to your past and your ability to recognize that your “correspondent” voice had changed.